A couple confronts the truth about their relationship when a stunning revelation turns their woodland getaway into a fight for survival. To celebrate their one-year wedding anniversary, Jules and Jackie arrive at a remote woodland home from Jackie’s childhood for a weekend getaway in Timber Bay. After unpacking, Jules finds Jackie strangely entranced outside in front of a sunken boathouse. After Jackie plays a haunting song on her guitar, the two women settle in for an intimate evening together. The night is interrupted by the unexpected arrival of Sarah, a childhood friend of Jackie’s who lives across the lake and wondered who was in the long empty home. Jules is confused when Sarah refers to Jackie as Meghan, although Jules plays along. While jogging the next morning, Jules finds an overturned boat with strange scratches on its side. Attempting to make amends for lying about her real name, Jackie asks Jules to go out on the water with her. Jackie explains that she was merely trying to disassociate herself from a traumatic past and never meant to deceive Jules. Jackie gifts Jules with a locket containing a picture of the two of them together. The two women practice shooting guns. Jules is surprised to discover Jackie is a confidently skilled marksman. Jackie tells Jules a story about hunting with her father as a child. Jackie recounts shooting a black bear that did not immediately die. Jackie’s father gave her a knife to finish killing the bear while telling her, “you only kill what keeps you alive.” When Jules asks what her father meant, Jackie explains that they ate bear meat for the next several weeks. Jules wakes the next morning to a voicemail from Jackie saying that she went into town alone. Jules uses the opportunity to row the long distance across the lake to Sarah’s home to learn more about Jackie’s secretive past from Sarah and her husband Daniel. Sarah tells Jules about their childhood friend Jenny, who drowned in an incident that cast suspicion on Jackie for possibly being involved. Jules asks Jackie about Jenny while hiking later. Surprised that Jules went to Sarah, Jackie explains that Jenny’s death was an accident and police cleared her of wrongdoing. After learning that Jules also arranged for them to have dinner with Sarah and Daniel, Jackie pushes Jules off a short cliff to her apparent death. Jackie returns to the cabin to rehearse calling police in hysterics. However, when she returns to the bottom of the cliff, Jackie finds Jules missing. Jackie puts a tranquilizer in her rifle and goes hunting for Jules. Staying hidden from Jackie, Jules makes it back to the cabin. Although unable to get a signal to call for help, Jules manages to stitch her wounds with a first aid kit. Jackie returns to the cabin to find Jules trying to row across the lake to Sarah and Daniel’s house. Jackie attempts to shoot at Jules. Jackie gets in another boat to row after Jules. Jackie jumps aboard Jules’ boat for a confrontation that Daniel witnesses from a distance. Daniel asks if the women are okay and if they are still on for dinner the next day. Jackie tries to cancel the arrangement when Jules, attempting to buy more time so that Jackie cannot kill her, interrupts to suggest that the two couples get together that evening instead. Daniel agrees, forcing Jackie to go along with the new plan to avoid suspicion. Jackie and Jules return to their cabin. While bathing Jules, Jackie explains that she intends to murder her for the life insurance payout. Jackie holds Jules underwater before threatening to stab Sarah if Jules says anything at dinner. Jules makes a plea for Jackie to get help. Jackie indicates that she also killed her first wife Erica. Sarah and Daniel arrive for dinner. After drinks, music, and awkward conversation, Jules whispers to Sarah while Jackie is preoccupied with Daniel on the porch. When Jackie spies Jules speaking privately to Sarah, Jackie slits Daniel’s throat so that the other two women can see. Sarah runs upstairs. Jackie chases after Sarah. Jackie says, “Jenny fought harder” before stabbing Sarah to death. Jackie hacks up one of the bodies. She then forces Jules to dismember the other one. The two women then row onto the lake to dump the severed body parts. Jackie leaves Jules tied to a bed while she cleans up the blood in the cabin. Jules dreams of breaking free and stabbing Jackie in her chest. Jackie releases Jules. Behind the mounted black bear head, Jules finds a tin of numerous lockets like the one Jackie gave her, revealing that Jackie has murdered multiple victims. Jules realizes that her own death was never about money. Rather, Jackie is merely a serial killing psychopath. Jackie drives Jules back toward the cliff to throw her off once again. Having pocketed the dart earlier, Jules stabs Jackie with the tranquilizer and flees the car. Jackie groggily chases Jules through the woods, but collapses to the ground once they reach the cliff. Jules recovers Jackie’s knife, but decides to drive away instead of killing Jackie. Seeing a crow reminds Jules of her tattoo and the notion that she will always be prey to Jackie’s predator. Jules returns to the cliff for a final confrontation only to find Jackie gone. Jules returns to the cabin and sets up stereo speakers to lure Jackie back with loud music. Jackie returns. Jules uses an antique hunting rifle to take Jackie at gunpoint. Jackie warns that Jules will be killed by shrapnel if she tries firing the old gun. Jules tries firing anyway, leading to a long fight between the two women that culminates when Jackie seemingly kills Jules upstairs. Jackie dumps Jules’ body off the cliff and calls 911. Jackie, a diabetic, returns to the cabin to take her insulin. Feeling strange following the injection, Jackie finds a video on her laptop that Jules previously recorded. In the video, Jules reveals that in case Jackie killed her, she poisoned the insulin to slowly kill Jackie. Jackie runs into the forest and experiences a flashback to the black bear before suffering a stroke. Jules is seen still lying below the cliff. A breath is heard as the camera cuts to black. Filmmaker Colin Minihan possesses an exceptional eye for dissecting horror subgenres down to core essentials that routinely make them tick. His other eye then sees precisely how to rebuild from that blueprint using efficient, engaging style. End results regularly turn familiar formulas into fresh entertainment. For my money, Minihan’s “Grave Encounters” (review here) remains the slickest, scariest haunted asylum “found footage” film in a pool flooded with countless careless peers. By reducing a post-apocalyptic outbreak scenario to one resilient woman and one persistent zombie, “It Stains the Sands Red” (review here) similarly injected inspiration into another done to death backdrop. The catch-22 with this pattern of marking new footprints in trampled territories is that Minihan ends up handcuffed creatively due to common clichés that unavoidably travel within these premises. His movies are enjoyable and well conceived, yet their edges get dinged by telegraphed tropes sacrificing realism for cinematicism. Minihan’s forest-set survival thriller “What Keeps You Alive” provides another case study. Kept taut using a duo of dialed in performances and a nearly relentless rhythm, the movie satisfies with straight razor suspense and sharply structured setups. However, intentionally Spartan scale stays so simplified, the screenplay has no better path than to run full speed into predictable beats. This is more than a mere Chekhov’s gun. This is a straight up spoiler. My seat cushion has barely warmed and the first thing I’m told about Jackie is how she is more than likely going to be done in. This example highlights how Colin Minihan is a self-aware writer/director simultaneously restricted by his plot’s inherent limitations. He knows he has to establish that Jackie is diabetic while placing a needle in the toy box for later. But he hides this reveal as best he can by staging Jackie in a distant room and masking her shout as a maybe meaningless sentence while Jules occupies the frame. This is what I mean about getting cornered by a cliché, yet compensating with as clever a tactic as possible, even though this one doesn’t fool anybody. “What Keeps You Alive” steps in these traps elsewhere, like when Jules mutters information out loud to herself while stitching her own wounds. The cynical viewer in me wonders why anyone would describe details when no one else is listening. The sympathetic critic in me counters, “what’s a better option for communicating exposition when only one person is onscreen?” Again, “What Keeps You Alive” often finds itself damned when it does as well as damned when it doesn’t. The movie moves spryly enough that there at least aren’t long lulls for scattered weak spots to topple dominant strengths. The list of contrivances can be lengthened by citing each instance of someone leaving another person alone for no reason but to spark a subsequent scene, e.g. Jackie letting Jules and Sarah out of her sight at a key moment. Plenty of behavior only makes sense for a screenplay as opposed to an organic circumstance, yet that’s the price paid to sustain film fantasy suspense, which keeps momentum sizzling steadily. Early on, “What Keeps You Alive” doesn’t give outward indications of exactly where it is headed. Jules senses intangible discomfort whenever she catches Jackie entranced in a vacant stare. An unexpected meeting with a childhood friend adds another clue that Jackie and Jules sit on dynamite, yet the movie still won’t show the fuse. From suggestion and misdirection, tension seethes in the pinpoint framing of Jackie in the foreground and Jules on a cliff’s edge. We see the possibilities, but the plot patiently teases every last second of anticipation before at last revealing its hand. Once cards are on the table, Brittany Allen, taking a touch of Michelle Williams, and Hannah Emily Anderson, channeling an echo of Allison Williams, carry almost the entirety of the film on their capable backs. Every bit of acting rings true with nail-biting believability. Anderson slithers slyly as a femme fatale fabulist while Allen ably embodies demureness and determination across the arc of Jules’ evolvement. As personalities shift positions, individual portrayals remain true to their multilayered characterizations. The ace up the film’s other sleeve is its intelligent employment of deceptively simple visuals. Several great Steadicam movements make meals out of tight location morsels to artfully amplify production design. One terrific shot features a fight that the audience never sees, with action captured instead by a camera following sounds on the ceiling while light fixtures sway from impact. This is certainly less complicated than choreographing an intricate sequence between two actresses who aren’t professional stunt performers. But the creativity behind this economical alternative adds a great deal of flair. “What Keeps You Alive” does become over-enamored with its own sense of style though. Several scenes hit with too heavy a hand on the force-fed metaphor front. One slow-motion sequence set to a classical Beethoven piece is plenty. Three smacks of pure overindulgence, particularly when one takes place in luminol-speckled black light to boot. Filmdom needs another woodland ‘predator versus prey’ premise with a “Most Dangerous Game” theme like the aforementioned “found footage” subset needs another paranormal building investigation. 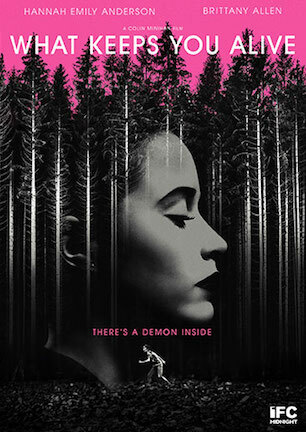 On the other hand, the “Black Rock” (review here) meets “Single White Female” vibe of “What Keeps You Alive” makes it one of the best in show for its category, as consistently appears to be the case when Colin Minihan’s team is involved. Getting by on being well done from start to finish has brought Minihan’s films farther than peers have gone when burdened with the same baggage. Here’s hoping future efforts roam further off the leash. Eventually, adhering too close to proven templates might lock the director in a trap that sleek tweaks can’t wiggle out of. April 11, 2018 by Ian Sedensky.